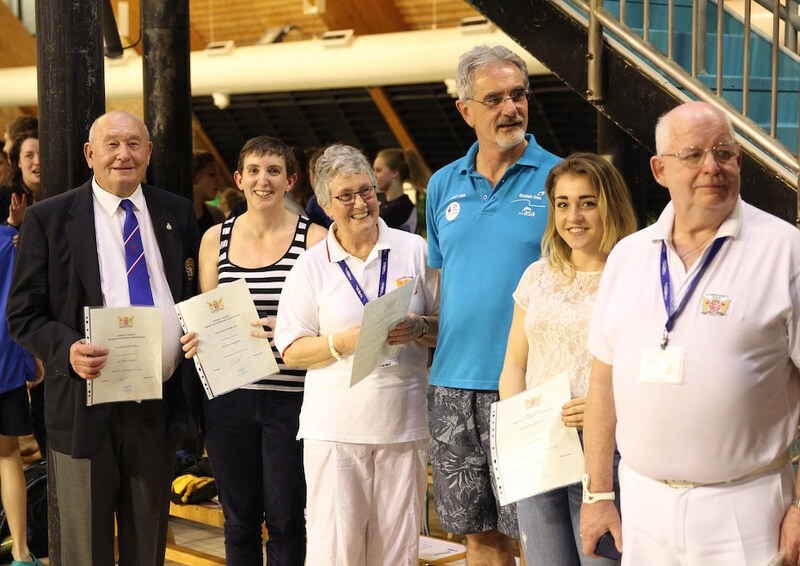 On Saturday 28 February, the annual DCASA Volunteer Awards were presented to this year’s winners during the 2015 Dorset County Championships at Littledown. The seven category winners were as follows: Club Volunteer of the Year – Steve Meter, Weymouth SC; Outstanding Contribution by a Young Volunteer – Starr Sams, Tornadoes of South Dorset; Outstanding Contribution to Swimming in the Community – John Gibbs, Swim Bournemouth; Outstanding Contribution at County/Regional Level – Gordon Smart, Poole SC; Services to Officials Development – Wendy Hooper, Poole SC; Volunteer Teacher/Coach of the Year – Karen Yendole, Bournemouth SC; and finally a joint award for Celebrating Excellence in Club Volunteering – Marissa and Kevin Roberts, Seagulls SC. Many congratulations to all these winners! PHOTO (courtesy of DE Photo): L to R – Gordon Smart, Karen Yendole, Wendy Hooper, John Gibbs, Starr Sams, and Steve Meter. This award has been given for dedicated service first to New Milton Torpedoes and, following the merger, with Christchurch Seagulls. Having been Fixtures Secretary and a Hampshire timekeeper with Torpedoes, Jenny continues to organise gala team selections and officiate with Seagulls, working quietly away out of the limelight as she has done for the past 17 years. This award has been given for 25 years or more service to Tornadoes of South Dorset. Gina first started teaching for Tornadoes in 1984 and progressed to squad coach, Deputy Head Coach and coaching swimmers with disabilities – and medal winning swimmers at that. Gina is a great servant to the club and will roll up her sleeves for any job that required. We have two nominations for the category of Young Volunteer, an award that is made to a young person less than 18 years of age. Both winners have shown dedication to their respective clubs, in particular in supporting and helping to develop younger swimmers. Both have or are undertaking the Young Volunteers Programme and are proving to be great assets to their clubs. This award recognises the outstanding contribution of a coach of children in the development of basic skills. 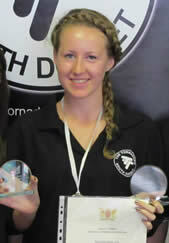 Helen has been with Tornadoes since 2009 and is regarded as an excellent teacher. Not only does she deliver the fundamental skills necessary for beginners, she makes the whole experience fun too. This award recognises the achievements of a coach working to develop emerging and young performers from within swimming. With Rob’s guidance Christchurch Seagulls water polo teams have become a serious force to be reckoned at both Regional and County levels in just five years, while he can also be credited for producing a number of players who have been selected for national squads. Seagulls Water Polo is now one of the highest ranked clubs in the GB Junior set-up. This award recognises the achievements of a coach working with athletes at the highest level of performance in the sport. 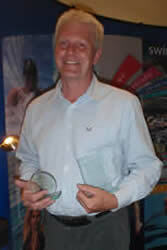 This is a retrospective award – and long overdue – in recognition of the contribution that Tony has made as Head Coach of Ferndown Otters to high-performance swimming at County, regional and national levels. During his 25 years plus as a coach Tony has coached over 20 International swimmers as well as two World Championship long course swimmers. 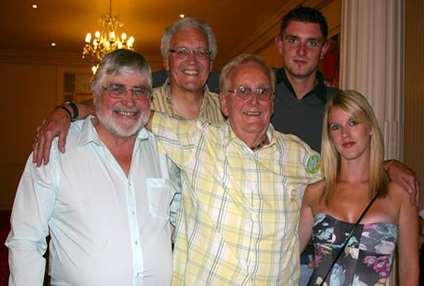 Laurie (centre) with (left to right) his first ever National Champion Jimmy Faben (1966), Commonwealth Games silver medallist Malcolm Tucker (1966) and more recent National Champions Ben Gibbs and Danielle Moore. Another award long overdue – this award is for someone who at 81 years young is still coaching at home and abroad, who has continued to make a significant contribution to swimming throughout his very long career and who has given his heart and soul to the sport. 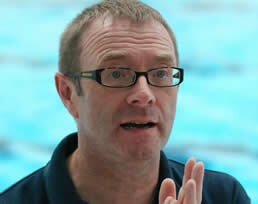 Laurie is ex-Head Coach of Bournemouth Dolphins, the current Coach of Littledown Masters and in his time has produced a string of National Champions, a Commonwealth Games medallist and more recent World triathlete champions. In his spare time he is Chairman of Salisbury Stingrays. 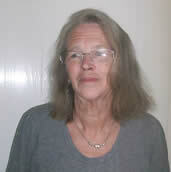 Gail has been a lifetime member of Poole SC from a young swimmer, Masters swimmer, teacher and finally coach. Since her appointment as Director of Swimming she has been responsible for organising teachers, coaches and watertime throughout the club, recruiting and mentoring Young Volunteers and is the cement that holds the club together. The following nominations have been also been forwarded to the ASA South West Region as Dorset’s nomination in the relevant category for the Regional Aquaforce Awards: Jenny Berry, Gina Crosier, Jamie Druce, Mikaela Dashwood, Helen Ellis, Rob Webber, Tony Watson, Laurie Dormer and Gail Nuttall. 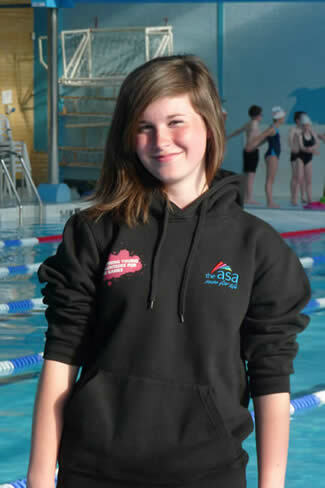 Congratulations go to Christchurch Seagulls’ Sophie Duffell who has been selected for the British Swimming Volunteer Training Programme. 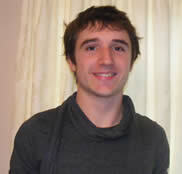 One of only two Young Volunteers selected from the ASA South West region, the 15 year old Twynham School pupil will now be invited to attend two training days on Cultural Awareness and Understanding as well as Leadership Skills, which are designed to provide the experience and the skills set required as a volunteer at London 2012. Volunteers from all different backgrounds will be involved in the programme as well as the the top volunteers from the ‘Inspiring Young Volunteers for the Games’ programme. Sophie is currently participating in this season’s Dorset Young Volunteers Programme which requires 25 hours of voluntary service in-club together with attendance at two full-day workshops consisting of both classroom and practical poolside sessions. The Programme includes the Young Aquatic Organisers module, as well as Team Manager, Club Timekeepers and Judge 1 training, providing the YVs with the skills required to organise, manage and officiate at aquatic events. Our clubs would not be able to function without volunteers giving freely of their time, skills and enthusiasm and each year clubs are invited to nominate individuals for the Dorset Volunteer Awards in recognition of the contribution they make. DCASA Volunteer Award winners for 2010 are: Outstanding Contribution at Club Level category – Alison Budynkiewicz (East Dorset Open Water) and Chris Beal (Tornadoes of South Dorset); Outstanding Contribution at County and/or Regional Level – John Masters (Tornadoes of South Dorset); Long Service Award (25 years or more) – Chris Esmond (Tornadoes of South Dorset); Outstanding Contribution by an 18-25 Year old – Abi Free (Tornadoes of South Dorset); Young Volunteer (under 18 years) – Kristy Rides (Christchurch & New Milton Seagulls), Emiley Taylor (Wareham & Districvt) and Amy Wright (Tornadoes of South Dorset). The following award winners have also been submitted as Dorset’s category nomination for an ASASWR Aquaforce Award: Alison Budynkiewicz, John Masters, Chris Esmond, Abi Free and Emiley Taylor. Twenty-one of Dorset’s under 18s have completed the 2009-2010 Young Volunteers Programme as follows: BDSC – Louis Bridet and Peter Lawson; Blandford – Sam Bailey, William Burnell, John Paul Flavell, Hannah Jack, Dustin Mackay, Stephen Pike; Bridport Barracudas – Matthew Cracknell and Martha Howlett; Bournemouth SC – Elizabeth Niemier; Ferndown SC – Tegan Collins, Charlie Roberts, Christopher Wignall; West Dorset – Guy Buttle, Tom Cooper, Katie Robinson, Hayley Rooks, Hattie Stewart, Francesca Taylor, Gemma Wellman.